It’s a sobering fact of life that many of us will at some time have to deal with a major disaster. A fire, flood, tornado, earthquake, or hurricane can cause serious or even devastating damage. Having an emergency preparedness kit is the smart thing to do. But what should you pack in your kit? Here are some important tips from some leading emergency management organizations. There are some basic things that you should have packed and ready in a “Go Bag” in case you need to evacuate your area. When it comes to food and water, packing at least a 3-day supply for each member of the family is recommended. Keep these supplies in something easy to carry such as a backpack (you could pack one for each member of the family) or bucket or plastic tub and keep it someplace everyone can access. Water– It’s possible to buy purified water in cans or pouches online that have a 5 to 50-year shelf life. Food – Pack only non-perishable items. Energy bars are good since they are calorie dense but small and lightweight. Flashlight/radio – A hand-cranked combo of the two is the best choice since you won’t need to pack and carry batteries. First aid kit – Get one with at least basic medicines and first aid supplies to deal with minor injuries. Extra keys – To the house, car, or business. Medications – Pack an extra weeks supply of any medications you may be presently taking. Extra cash – Since banks may be closed and ATMs inoperable, have some cash in small bills. Chargers – Pack extra cell phone chargers and backup batteries. Pet food – Whatever pets you have, pack a 3-day supply of their food also. Personal hygiene items – Don’t forget to pack such necessary items as a toothbrush, floss, toothpaste, and soap. 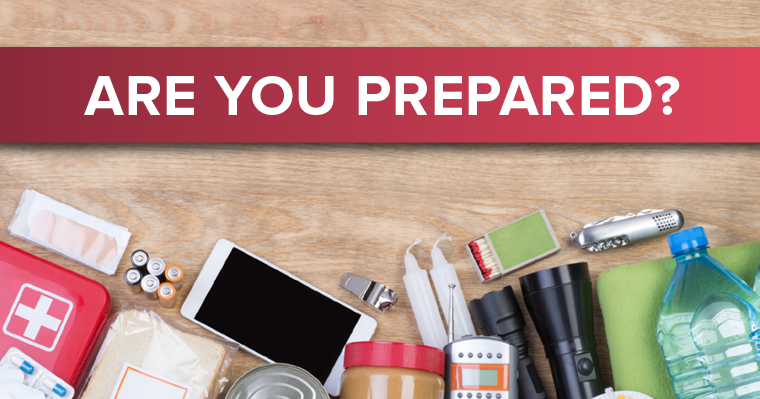 Many stores and online businesses sell pre-packaged emergency and food kits so there are several options available for making sure you and your family are prepared for the worst. 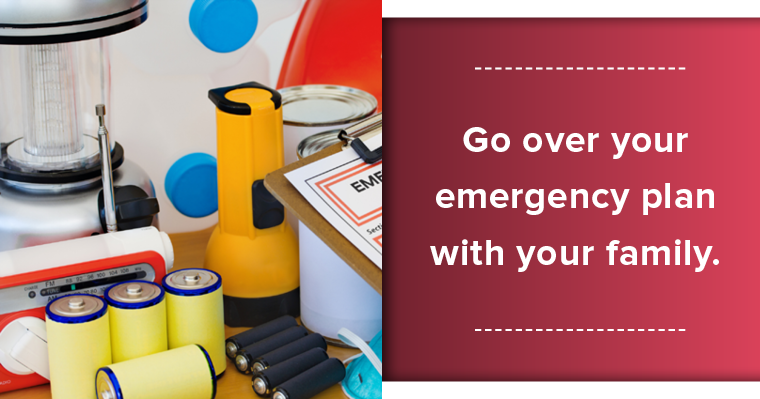 Discuss with your family how to respond to the different types of emergencies likely to arise in your area. Plan where you will meet in case you become separated. Have a way to notify loved ones that you are safe. You can do this on the American Red Cross Safe and Well website or call 1-800-RED-CROSS and select “Disaster” to register yourself and your family. Delegate responsibilities to each family member in accord with age and ability. Practice your plan until everyone feels comfortable with their role. Having an emergency plan in place has been life-saving in some situations! So don’t put it off. That old boy scout motto is a piece of very good advice! Being prepared for an emergency does take some extra time and planning but the safety of you and your family is worth any effort it takes, isn’t it? Why not set aside time this week to work up a plan with your family and get an emergency “Go Bag” ready. You’ll sleep better at night knowing that whatever may arise, you and your family are prepared to meet it!